"These chicken wings never disappoint. They get devoured as soon as they get put on the table. The sauce is rich and dark so they are great for Halloween parties, just call them glazed bat wings for the holiday." Whisk Worcestershire sauce, honey, oyster sauce, soy sauce, garlic, vinegar, thyme, sesame seeds, and Chinese five-spice powder together in a large bowl; add chicken wings and toss to coat completely. Let chicken marinate 30 minutes. 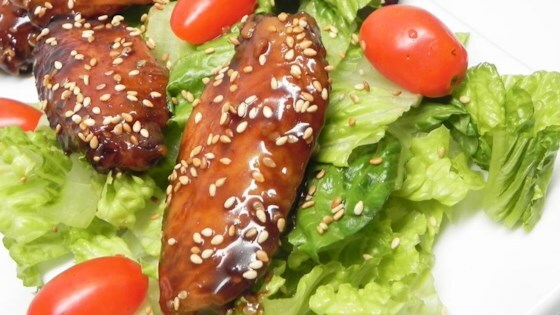 Transfer chicken wings and marinade to a deep baking dish. Bake wings in the preheated oven, turning and spooning marinade over wings every 20 minutes, until chicken is cooked through and sauce is thick and bubbling, about 90 minutes. Yes, you can get crispy chicken wings from the oven. My family liked it although I thought it was a little salty and not sweet at all. The better half loved it it's booked for the next chook meal.